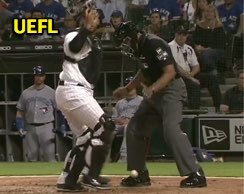 When home plate umpire CB Bucknor ruled that a pitched ball lodged in his person or paraphernalia during Friday's Blue Jays-White Sox game before falling to the ground, he invoked Official Baseball Rule 5.06(c)(7) in calling "Time" and scoring Toronto baserunner Russell Martin from third base to Chicago's chagrin. Was this the correct call? HP Umpire Bucknor caught a pitched ball. The Play: With one out and the bases loaded in the top of the 5th inning of the Blue Jays-White Sox game, White Sox pitcher Thyago Vieira's 1-2 fastball to Jays batter Curtis Granderson bounced in the dirt and passed Sox catcher Omar Narvaez, Blue Jays baserunner R3 Russell Martin taking off for home plate as the ball struck HP Umpire CB Bucknor in the left hand before coming to rest in a sling formed by Bucknor's right arm and wrist against his torso. Sensing the ball was trapped between his right wrist and waist, Bucknor parted his arms and called "Time" as the ball, no longer supported by Bucknor's arm, fell to the ground as gravity tends to do. The Rule: In calling "Time" and declaring the play dead, awarding Martin and his fellow Blue Jays baserunners one base, Bucknor invoked Official Baseball Rule 5.06(c)(7), which states, "The ball becomes dead and runners advance one base, or return to their bases, without liability to be put out, when—A pitched ball lodges in the umpire’s or catcher’s mask or paraphernalia, and remains out of play, runners advance one base." In this sense, Bucknor's administration of the rule in declaring the play dead while awarding each baserunner one base was proper—that's the correct outcome for this rule. But does a ball getting stuck to an umpire qualify as lodging in his "mask or paraphernalia"? Precedent: Although the pitched ball decisively did not lodge in Bucknor's mask or equipment, there does exist precedent for declaring a ball out of play pursuant to Rule 5.06(c)(7) if it sticks to the umpire's person, and that precedent is encompassed in a Case Play from earlier this season, when HP Umpire Dan Bellino trapped a pitched ball between his right bicep and midsection, an "umpire's mitt" similar to that formed by Bucknor when he reacted to getting hit with a pitched ball. In the Bellino play, as in Bucknor's, the umpires ruled the wedged ball dead, though unlike Bucknor, Bellino did something small yet significant that highlights a key part of the rule and likely made Bellino's call a lot easier to explain. Related Post: UEFL Case Play 2018-4 - Bicep of Bellino [Solved] (6/1/18). When the pitched ball found Bellino's right arm in Colorado, he froze the offending appendage, thus keeping the ball lodged and out of play, wedged against his body. When Bellino called "Time" to signify Rule 5.06(c)(7)'s invocation, he similarly kept his right arm immobilized such that the ball remained out of play and stationary through the entirety of Bellino's one-handed "Time" signal. Bucknor explains his ruling to Joe McEwing. By doing this, Bellino ensured that the ball wedged in the crook of his right arm satisfied the "and remains out of play" criterion of Rule 5.06(c)(7). Compare and Contrast: Bucknor is in a tight squeeze here in more than one way. In general, an umpire calls "Time" by raising both arms and hands with outfacing palms; this is the mechanic Bucknor employs when he realizes the pitched ball has become lodged in his paraphernalia, interpreted—pursuant to the Bellino precedent—to be the "umpire's mitt" created by Bucknor's arm and body. 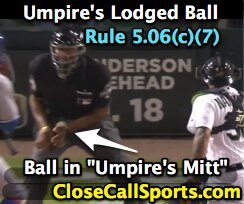 Unfortunately, when a ball rests atop an umpire's arm or wrist, moving said arm or wrist will invariably cause the ball to become loose, and, as it did here, this will result in the ball falling back into play. This raises the question of whether Bucknor's lodged ball met Rule 5.06(c)(7)'s criterion of "remains out of play." Ball drops as soon as Bucknor's arm moves. 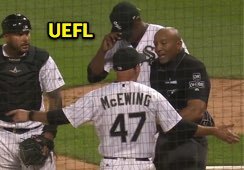 How to Solve This: Bucknor's call is more difficult to explain to White Sox bench coach Joe McEwing (acting manager for the ejected Rick Renteria) because, unlike Bellino in Colorado, Bucknor raised both arms to call "Time" whereas Bellino raised just the left arm—the arm that was not part of the "umpire's mitt." Accordingly, while Bellino was able to keep the ball stuck to his person, Bucknor was not, since he raised the involved arm to call "Time." We could debate the merits of a ball getting pinned between an elbow and the body vs a forearm and the body (both of which are inaccessible to the fielder and should therefore be deemed out of play), but the primary difference here is one of perception: Bellino kept his right arm static, thus keeping the ball pinned, whereas Bucknor moved his arm to call time, thus allowing the ball to drop as soon as he parted his hands, but by the time the ball came loose, Bucknor had already made his "lodged" decision and had committed to calling "Time." It's a lot easier to "sell" when an umpire keeps the ball lodged throughout the "Time" call, as Bellino did. The one thing an umpire should not do is start, and then stop, in calling "Time," the so-called umpire's balk. In that sense, Bucknor was correct to follow-through with his commitment to killing the play. BRD Pitfall: This is NOT "Handling a Live Ball": The language of the high school rulebook in particular revolving the phrase "handling a live ball" can be misleading, but know that if a similar play occurs in high school, this is not an example of "handling a live ball," for "handling" requires an intentional act on the umpire's behalf and occurs when the umpire voluntarily reaches for a live ball. In NCAA/OBR, the ball remains live under this circumstance, while in NFHS, the ball would become dead under the "handling a live ball" rule, 5-1-1h. Obviously, the Bellino/Bucknor plays involve accidental touching and lodging, rather than deliberate hand tampering.